Emerald Triangle - Lemon Haze Auto. Free US delivery. 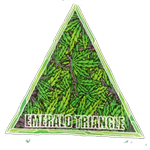 Here Emerald Triangle have blended together their BEST Lemon OG Kush with Original Haze and White Widow to create a lovely saliva based auto flowering plant with a life cycle of approximately 65 days from seed to harvest. Indoors, you will get the best yields if you use 20 hours of light. Lemon Haze auto has a sativa structure, with longer internodes than an Indica dominant strain. If grown indoors in hydro you may have to keep on top of her as she will want to get large!